This was made after I found a quilting pattern in a magazine. I thought I was being really clever in that all the teardrop shapes are from the holes they are near, but with a busy pattern like that it didn't show up.... still, I like it! 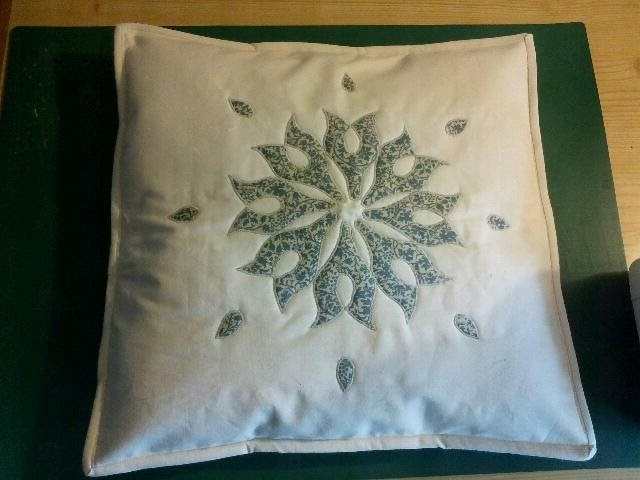 I used bondaweb to put the pattern on the cream and then appliqued it on. Great pattern, it makes a cute pillow! Sweet--it reminds me of a snowflake! Thanks for commenting on my churn dash quilt! I absolutely love what you said, "scrappy with attitude." I'm going to make that my new mantra. Your pillow is so pretty. I like the little teardrops.